Motovario Group has implemented a new layout for the adhesive labels of the gear reducers, speed variators and ATEX products. The identification labels of Motovario products will feature a QR Code which can be read by all mobile devices. 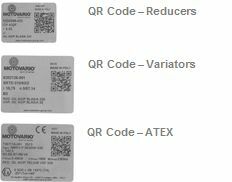 The QR Code will allow you to check the characteristics of each product thanks to the new composition of the production order that will feature a unique identification number. In this way Motovario customers will always be able to check the production order and have access to all the information related to the product, as well as being able to download the user and maintenance manuals and to send requests for assistance and information directly to Customer Service. The new labels will be placed on all the products assembled by Motovario Group, starting from the month of December.